A famous and powerful man abuses his power but it will take a determined woman to defend the woman she loves and teach the sexual predator a lesson he will never forget. The Intertwined Souls Inbetween Series are standalone novels of the award-winning Intertwined Souls Series. This novel – in the timeline of the series – sits between Where Shadows Linger (Book 2) and Hidden Truths (Book 3). When you’re a working woman in 1950, there is more to work than doing a great job. Unwanted advances, no matter how repulsive, are common. This is where Zoe Lambros, a young Arts College graduate, has found work at the prestigious Sydney Art Gallery as a junior art restorer. She has also attracted the unwanted and offensive attention of Sebastian Fletcher, one of Australia’s greatest artists. Zoe is not one to take a backward step, but she finds herself unable to fight back without losing the job she loves. No one is going to believe the young artist’s claims against an Australian icon. Enter Zoe’s lover who has decided to take matters into her own hands and is eager to take on the role of Zoe’s defender. A masquerade ball offers Eva Haralambos, Zoe’s dark-haired, blue eyed, six-foot tall peaceful and gentle partner, the chance to metamorphosize into a tattooed, leather clad Greaser on her own intimidatory mission. A Widgie Knight and Zoe’s Journal: Intertwined Souls Series Shorts, Volume 1 is an historical family saga novella written by Mary D. Brooks with illustrations by Lucia Nobrega. The Intertwined Souls saga is set in the mid-20th century in the aftermath of the Second World War. Zoe and Eva are a lesbian couple who have emigrated to Australia. Zoe is a talented artist who has obtained a position in the Sydney Art Gallery, where she works as a junior art restorer. While she loves the creative aspects of her work, the unwanted attentions of Sebastian Fletcher, a renowned and highly influential artist, are making her work existence a hellish and frightening experience. Zoe knows his position in the gallery means he can have her fired, and she feels helpless and vulnerable. When he traps her in a storeroom and his rough handling injures her, Eva decides to take matters into her own hands. Eva is a tall woman, who can assume a most intimidating role if necessary, even if it is completely antithetical to her genuine and unassuming nature. She will be assuming the role of Zoe’s widgie knight at the masquerade party which the gallery is holding, and Fletcher won’t be bothering Zoe anymore. Mary D. Brooks’ historical family saga, A Widgie Knight and Zoe’s Journal: Intertwined Souls Series Shorts, Volume 1, is an illuminating exploration into the lives of Zoe and Eva, five years after their emigration from Europe. I had previously read book 5 in the Intertwined Souls Sage, No Good Deed, and appreciated seeing the two women at this earlier stage in their lives and relationships. Brooks defines the word ‘widgie’ for those readers who are not familiar with the Australian lingo of the 1950s, and Lucia Nobrega’s stylish illustrations reinforce the concept quite well. Brooks’ saga deftly points out the stresses and subterfuge that were part of the survival gear for lesbians and gays at the time, and watching Eva’s discomfort and pain as Zoe is interacting with her ‘pretend boyfriend’ Patrick was a most poignant and moving part of the story. Zoe’s Journal is a joy to read as her voice is bright and loving, and seeing life through her eyes is a illuminating experience. A Widgie Knight and Zoe’s Journal: Intertwined Souls Series Shorts, Volume 1 is highly recommended. I simply adore historical fiction and have read author Mary D. Brooks’ “Intertwined Souls” series from start to finish. I often think of that series as my own personal Outlander and loved how Diana Gabaldon wrote a lot of short novellas to keep the magic alive. Brooks has done the same here with “A Widgie Knight” and it is nothing short of magical. Eva and Zoe are definitely a pair of world travelers in this series and this novella takes place when they are living in Australia in 1950. Zoe is an arts student and one of Australia’s greatest artists, Sebastian Fletcher, has taken notice of her. Unfortunately, he hasn’t taken notice of her talent but of her body and he has no intention of taking no for an answer. Zoe’s partner, Eva, isn’t too happy about this and finds a way to fight back. Normally a gentle soul, a masquerade ball give Eva the chance to transform into a pretty intimidating force to be reckoned with. The encounter between the two is something not to be missed. Another great read from Brooks that was both entertaining and touching. I really enjoyed the illustrations throughout that brought the story to life for me. Brooks has a way deepening my appreciation for this couple’s commitment to each other every time that I am exposed to them. I also loved Zoe’s journal entry at the end of the story as she recounted the experience and watched Eva sleep. Great read! A Widgie Knight is a delightful novella, a compelling, irresistible story that gives the reader a new, refreshing glimpse of Eva and Zoe, both as individuals and as a couple. Mary D. Brooks’ use of humor and her deep understanding of her characters make this a true joy to read. The book includes one of Zoe’s journal entries in which she writes about her impressions of the events taking place in A Widgie Knight, and specifically about the woman she loves. Her voice is unique, bold and clear, and her personality shines in every line. Lucia Nobrega’s amazing illustrations add a new dimension to the story and the characters. When two so very talented people join forces, there is no other possible outcome than a book as wonderful as A Widgie Knight. Those of you who are already fans of the Intertwined Souls Series don’t need me to tell you this is a must-read, I’m sure, and those of you who aren’t…what are you waiting for? Get on board; it’s a wild, awesome ride. 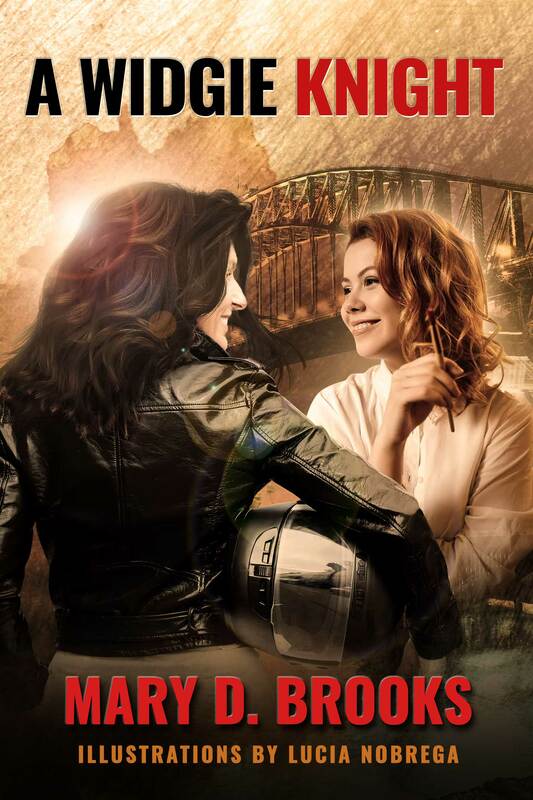 I’ve been a fan of Intertwined Souls since the year began, and I have to say, I was extremely excited to see a series of shorts being released about my favorite literary lesbian couple! You don’t have to read Intertwined Souls to know what’s going on in this one; their backstory is made very clear. You’ll root for Eva in her attempts to mask her gentle soul with that ruthless widgie attitude, and it’s so Eva to see her coming to her lady’s defense! Reading Zoe’s journal was pure magic, and it highlighted the intensity of her passion for the woman that changed her life in so many beautiful ways. The vibrant illustrations done by Lucia Nobrega painted even more of a mental picture of the time period, of the situation and of the girls as I read. Mary D. Brooks masters the art of romantic fiction with her delightful, heart-rendering characters and clever unfolding of their adventures. I can’t wait to read more! Convinced yet? Want To Read a FREE Excerpt of A Widgie Knight? Click here to read first three chapters!